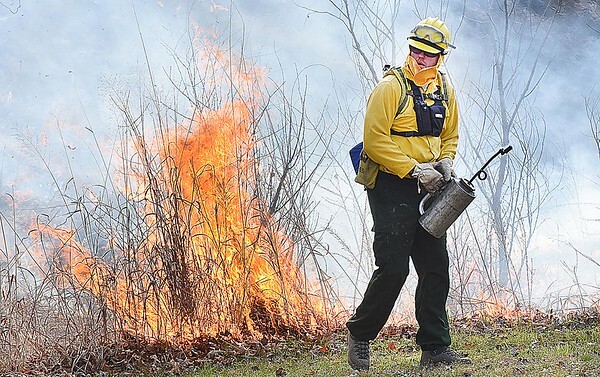 Nate Frier, Fire fighters with the National Park Service, helped conduct a prescribed burn Wednesday morning at the Sandstone Visitor Center in Summers Co. It's a yearly event they do to help the native landscape surrounding the Visitor Center. Separate burns will also be held at Backus Mountain in southeastern Fayette County, at Carper Fields and Grandview in northeastern Raleigh County. The National Park Service says about 120 acres will be burned to the end of May, depending on weather conditions. The goal of the fires is to reduce the threat of future wildfires, control the growth of woodland species into open meadows, improve wildlife habitat and promote the growth of oak seedlings. Smoke was visible from Interstate 64 during the Sandstone fire and the Sandstone Visitor Center was temporarily closed to ensure safety.